A mixed-use development aiming to address London's housing shortage by providing quality homes for long-term rent. 173 purpose-designed flats, communal facilities and commercial uses promote a vibrant community. The private rented sector (PRS) development, Rehearsal Rooms, is in the Royal Oak Opportunity Area and forms part of an emerging vibrant neighbourhood around the North Acton underground station. 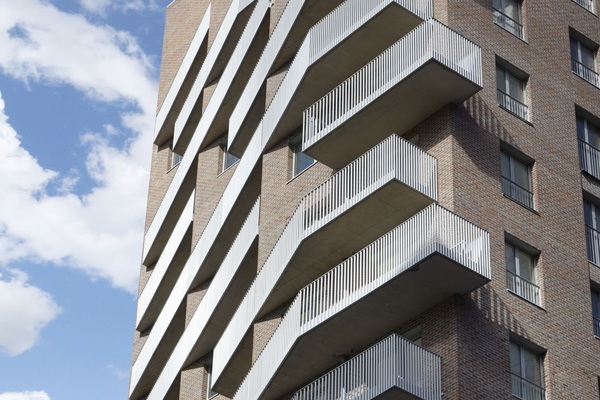 Working with joint development partners Hub and M&G Real Estate, Newground Architects designed a scheme of 173 one, two and three bedroom flats to suit the specific needs of long-term renters. The initial planning consent in 2014 granted a 17-storey tower to the west and an 11-storey tower to the east. 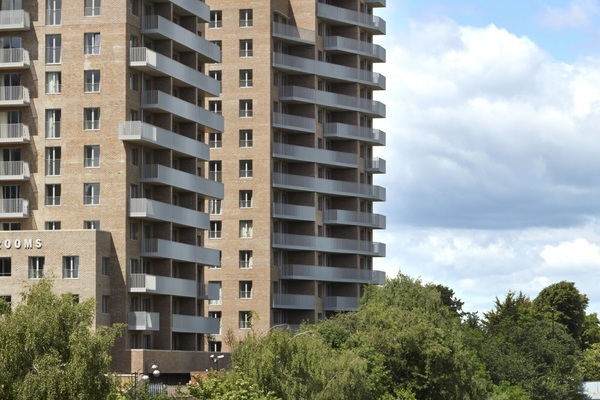 Connected by a 4-storey link block, the scheme provided 152 flats. Following planning consent in June 2016 for three additional levels on the east tower, 21 more flats were added. The additional levels were designed as a seamless extension with external materials and details to match lower levels through using lightweight structure in contrast to the concrete frame below. 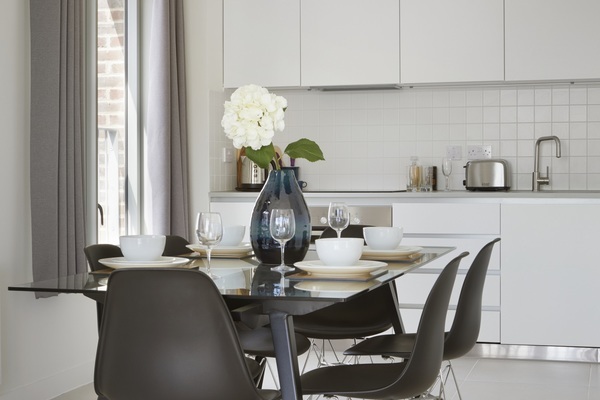 On-site facilities for residents include a local supermarket, retail, lettings office, concierge services and an informal resident meeting space at ground floor. There is also a function room with direct access to a roof terrace and a rooftop allotment garden for growing food. A ground level part-covered courtyard provides for a limited number of disabled car spaces, car club parking and a safe delivery bay for removals. The PRS use has shaped the layout with open-plan flats, spacious bedrooms of equal size, each with en-suite bathrooms, large private balconies and terraces to all flats. The simple and rational design concept is clearly expressed in the use of a small range of materials and well-considered details which aim to create a building of distinction and timeless quality. HUB’s goal was to make the Rehearsal Rooms – the first purpose-built PRS scheme in Ealing – stand out through sustainable, well thought-out design. After purchasing the site in 2013 with outline planning consent for 151 units, HUB appointed Newground Architects to fully review the consented scheme and propose changes to improve and rationalise the design. Having worked with Jordan Perlman and Ziba Adrangi in his previous role at Argent, HUB’s managing director Steve Sanham was familiar with Newground’s ability to design efficient, rational and cost-effective buildings. The scheme was fully redesigned to improve gross-to-net efficiency and provide apartment layouts, amenity spaces, function rooms and common areas tailored specifically to the private rented sector. It was important to both Newground and HUB to set a new benchmark of design quality in the sector and to realise the scheme in a way that meant market rent and discount market rent homes could have the same specifications. Working with Ealing Council, the changes were consented through a Section 96A application and the Section 106 varied to allow the delivery of the affordable housing as a Discount Market Rent product. The project began with a deceptively simple brief for ‘better homes for everyday Londoners’. The clarity we aimed for belies the complex process involved in reconciling design intent, planning requirements, financial constraints and the myriad compliance and technical issues. Newground and HUB have worked together on other projects and appreciate that making better buildings involves more than just replicating PRS requirements now commonplace, such as equally sized bedrooms, plentiful storage and amenity space, communal spaces and high quality materials. Our intention has been to incorporate these without waiving qualitative design aspects. We looked at things like views through open-plan layouts, emphasising qualities of space and light and allowing connections from inside to oversized balconies. 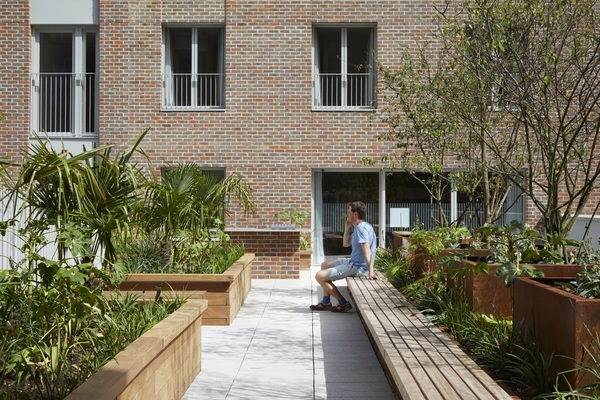 In the common parts, we considered movement through the building to encourage legibility and interaction, providing a range of purpose-designed communal spaces linked to shared external gardens. The design development process was complex. The collaborative relationship we built up with client and contractor helped them reconcile design, cost and programme issues simultaneously, with the ultimate prize being better buildings. 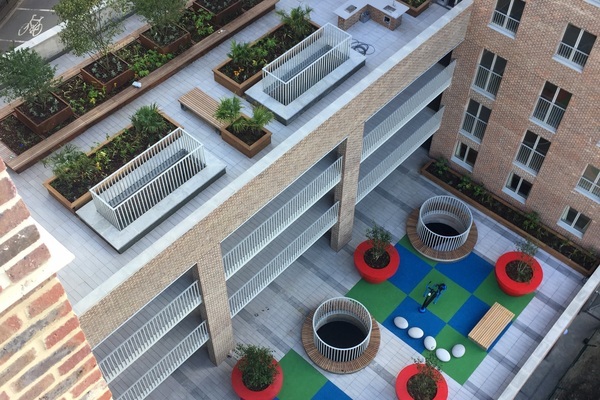 B|D developed a roofscape strategy of accessible, communal, productive and playable terraces alongside biodiverse areas with green and brown roofs on this confined urban site. 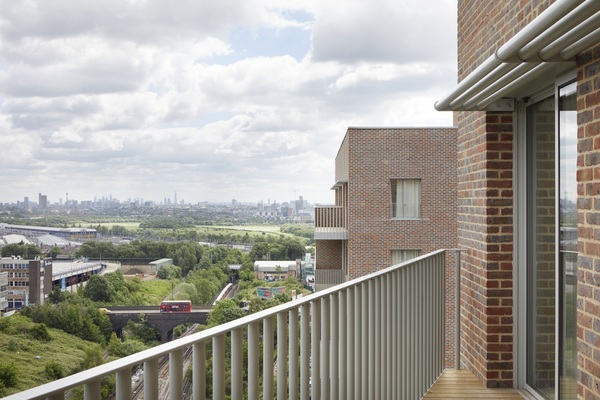 Each terrace had to work hard to provide useable amenity space with a distinct character that responded to the nature of the private rental development. On the first floor, a grid of multi-stem birch trees set within giant flowerpots provides dappled shade to the play and exercise terrace, which is furnished with a ping-pong table, gym equipment and an incidental play set within a patchwork of rubber crumb to create a place to socialise. The fourth-floor outdoor room is a place to relax, an inviting, south-facing terrace for social gathering and interaction. 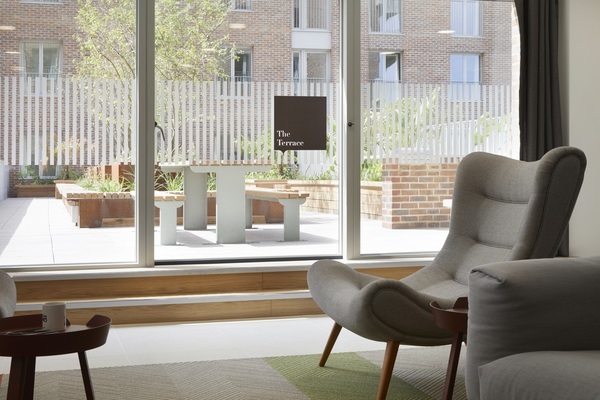 BBQs, food prep tables and communal dining areas create a space for residents to enjoy alongside a strong landscape character with a copse of umbelliform fruiting and flowering trees and sensory planting within generous but lightweight raised planters. 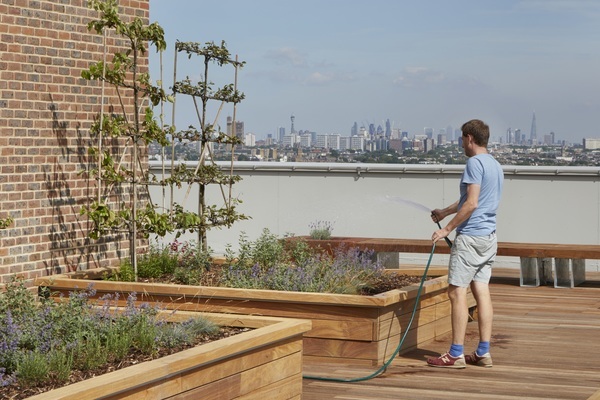 On the 10th floor is a residents’ allotment with a series of planters for residents’ use, creating a landscape to encourage the growth of the community. Fruiting espalier trees suited to the limited planter depth wrap around the central lift core. On the 13th, 14th and 17th floors soft landscapes include a mix of wildflower, sedum and brown roofs with plug planting to increase biodiversity.